Savor this shortest of seasons, now compressed into a few short weeks and in danger of disappearing altogether, as the Christmas monster relentlessly gobbles up ever more of the calendar. Autumn officially starts when pumpkins ripen in the fields and show up in colorful profusion at markets and roadside stands. This versatile member of the squash clan offers much more than Jack-o-lanterns and pies, so give your fairy godmother the day off and work a little magic of your own before they disappear until next year. I thought I knew all about pumpkins until I happened upon a delightful little book called Pumpkin Butternut and Squash by Elsa Petersen-Schepelern. She says that Australian cooks prefer blue, gray, or dark green pumpkins for cooking because they are mealier and less watery. Green pumpkins? Blue pumpkins? This I had to try, even if it meant I had to grow them myself. I found some names: Marblehead, buttercup, jarrahdale, Kent, and Queensland blue. Finding the seeds was not so easy. I searched through seed catalogs and display racks at all the local nurseries. Finally I found one. A jarrahdale, called Once in a Blue Moon, from the Livingston Seed Company. I started the seeds indoors and enlisted my husband’s help to prepare a plot. I set out my plants, envisioning a crop of plump, blue pumpkins sunning their fat bellies in the little patch at the end of the sports court. The plants sprouted vigorously, but our Washington Spring was even cooler and wetter than usual, so it was mid-August before the vines started to spread their prickly wings with doorknob-sized, blue babies nestled underneath. One pumpkin grew faster than the others, but alas, it was a cuckoo in the nest, a dark green infiltrator, not a Blue Moon. Some of my blue babies yellowed and passed away in infancy, but I held out hope for three surviving siblings. One was misshapen like a muffin, but all the more adorable for it. 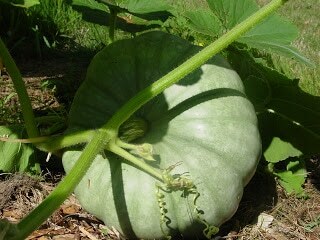 Summer ended abruptly in early September and my pumpkins are languishing. I’m hoping for a few more days of sunshine before I give up and sever their umbilicals and fry them up. Then I will find out if I have a future as a farmer or will be forever dependent on the selection available at my local roadside market. Note: A recent study hints that pumpkin may have advantages beyond its high-fiber and low-sugar content. In China, pumpkin is used as an herbal remedy for the treatment of diabetes. According to a paper published in the July, 2007 issue of the Journal of the Science of Food and Agriculture, researchers believe that a molecule called D-chiro-inositol, found in pumpkin, can mediate insulin activity and may actually be able to regenerate damaged cells in the pancreas that produce insulin. In a small study conducted at the East China Normal University, rats with type I diabetes were given an extract of pumpkin. After 30 days, study results showed that the diabetic rats who were given the extract had only five percent less insulin in their blood than the healthy rats in the control group. Pumpkin is one of the few non-starchy vegetables that will get brown and crisp without a coating of flour or batter. It has an amazing soft crunch that is quite addictive. Cut one pumpkin in half; scrape out the seeds and fibers. Cut into wedges and peel. Cut the wedges into thin strips about ½-inch wide by 3 inches long. Fry in small batches in a deep fryer at 365º F until golden brown and crisp. When all the strips are cooked, return them to the hot fat briefly to reheat and crisp before serving. Drain on paper towels and sprinkle with salt. A 2-pound pumpkin will make about 60 fries. Per Serving of 10 fries—Total Carb: 3.6, Fiber: 0.6, Net Carb: 3g. These have the same crunch as homemade potato chips with about ⅓ the carbohydrates. Pare, seed, and cut a fresh pumpkin into several pieces. Slice very thinly on a mandoline, with the slicing blade of the food processor, or with a potato peeler. Aim for uniform slices; cut off any narrow points and discard or save for another use. Fry a few slices at a time in oil in a deep fryer heated to 365º F until golden brown and crisp, about 2 to 3 minutes. Watch them carefully; if they become too dark, they will taste bitter. Drain on paper towels and sprinkle with salt. Serve hot, or let cool and store in an airtight container. One fourth of a 2-pound pumpkin will make about 50 chips at 0.1 net carbs per chip. Per ounce—Total Carb: 0.7g, Fiber: 0.1g, Net Carb: 0.6g. Blue Moon, Els Petersen-Schepelern, Pumpkin chips, Pumpkin fries, Pumpkin seed. Bookmark.